Your pet turtle's getting cold and that's bad. 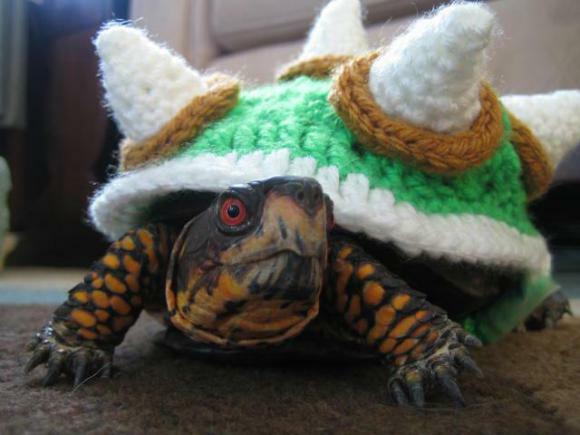 A custom crocheted sweater, however, will get that tortoise warm and cool at the same time, and that's very, very good! What's that you say? 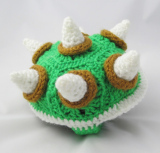 Never knitted anything turtle-sized or turtle-shaped? No problemo, it's never too late to start and Jennifer Olivarez is here to help from start to finish. Olivarez didn't just wake up one fine morning and decide then and there she was going to revolutionize the field of turtle/tortoise fashion design. Instead, pet-owning pal Lisa Egolf contacted her with a challenge – Make It! Challenge #5 to be exact – the goal of which was to crochet a sweater for her turtle (named Myrtle... he's male NTTAWWT) “so that he would be easy to spot when she lets him loose to play in the courtyard of the school where she teaches science.” Evidently the school's courtyard is awash with turtles but that's neither here nor there. “I think bright yet manly colors would be best,” advised Egolf, who didn't intend to complicate an already complex project premise but did exactly that in one short sentence. The proviso forced Olivarez to carefully consider the “what” and not just the “how” of the matter, and before making magic with her crocheting hooks she came up with something, well, magical. “If you're familiar with the Super Mario Bros. video game franchise,” she explained, “you undoubtedly remember Bowser as the game's super villain. The object of the '80s Nintendo game is to get the main character Mario through the Mushroom Kingdom, survive Bowser's attacks, and save Princess Toadstool. Running into Bowser, with his spiny shell, pug nose, and domineering height, is enough to make little Mario shiver.” Well shiver me timbers, it seems a plan is about to come together! 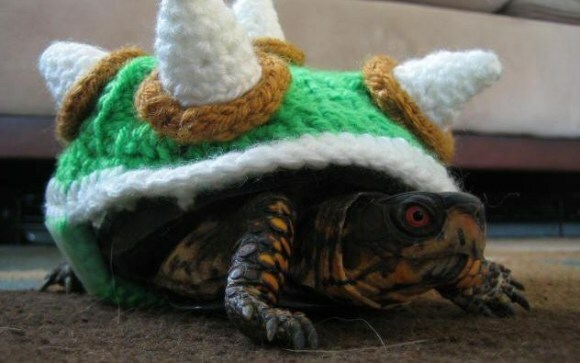 And so it did: Myrtle is both cuddly and cool in his Bowser-ized custom sweater with elastic belt. If you know a Box Turtle who's approximately 5 1/2? long by 4 3/4? wide and 2 1/2? tall, the detailed and illustrated instructions Olivarez posted at Squirrel Picnic will assist you in making the lucky critter's dreams come true.